The movement’s moral leader was Arialdo, who, according to Andrea da Strumi, Christ Himself had chosen, in defensione veritatis. Addressing the Milanese people, Arialdo exhorted them to separate themselves from bad priests and pastors with these words: “Those who wish sincerely to find the truth must boldly refute every form of deception. For this, whereby you can fully delight in the Truth, which is God, I entreat you, in His name, to stay away completely from false priests. Indeed, there cannot be any possibility of agreement or close union between light and darkness, between the faithful and the unbelievers, between Christ and Belial. It is in fact written: “Go out from among them, and be ye separate, saith the Lord, and touch not the unclean thing” (2 Cor. 6, 17-18). How can it be that He will not concede you the least, that is, pastors to guide you rightly, if you ask Him - He who, when none of you even existed, conceded you the most, that is, His very self for your salvation? Thus, try not to have anything to do with all the heretics and ask God confidently for good and faithful pastors; without doubt you will have them: be sure of this!”(p.69). The Lord – continued Arialdo, said: “If these shall hold their peace, the stones will cry out” (Luke 19,40) and also “Cursed be he that withholdeth his sword from blood”.(Jer. 48, 10). The sword invoked by Arialdo, was first and foremost that of the Word of God; but, when it was required, the reformers did not hesitate in taking up arms to defend themselves against the violent aggressions of their enemies, who were trying to obstruct their preaching. At his refusal, they cut off his ears, while Arialdo, raising his eyes to Heaven, said: “I thank Thee, O Christ, that today, you have deigned to number me among Your martyrs.” His torturers asked him again if he would acknowledge the authority of Guido, but he, maintaining his customary fortitude, said no. In an instant – his biographer recounts – they cut off his nose and upper lip. They gouged out both his eyes and severed his right hand, saying: “This is the hand that wrote letters to Rome.” Then they amputated his male member, saying: “Till now you have been a preacher of chastity; from henceforth you will also be chaste.” Lastly they tore out his tongue, saying: “Finally this tongue, that wreaked havoc in the families of clerics and broke them up, will be silent.” And thus, Andrea da Strumi concludes: “that holy soul was set free from the flesh; his body was then buried in that place. After the events in that place, at night, magnificent lights began to appear to fishermen.” (p.145). The murderers then tied heavy stones to his body and cast it into the deepest spot in Lake Maggiore. After ten months, however, on May 3rd 1067, Arialdo’s body miraculously rose to the surface. 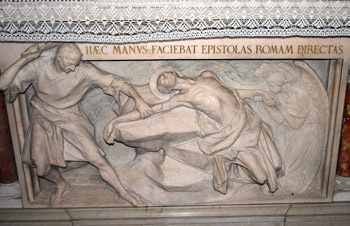 After much resistance, Donna Oliva sent his body to Erlembald, who returned it to Milan, where it was triumphantly laid in the Church of St. Ambrose, before being entombed in St. Celso’s, and, at the end of the XVIII century, in the Duomo. Alexander II beatified Arialdo in 1068. Archbishop Guido, after being excommunicated a second time, decided to renounce the Episcopate and asked the Emperor to nominate his chaplain Godfried as Bishop. 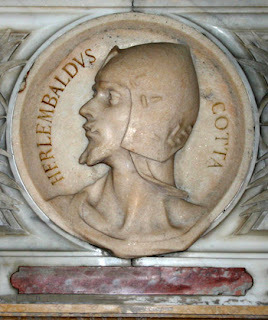 The Pope excommunicated Godfried and instructed Erlembald to stop him from entering Milan. A fight was set in motion that saw two opposing archbishops on the Cathedra of Milan. Godfried sustained by Henry IV. Attone, designated by Alexander II and backed by Erlembald. During one of the numerous armed clashes, Erlembald was killed on June 28, 1075, the same day Arialdo had been assassinated nine years earlier. In May 1095, Pope Urban II, who was passing through Milan on his way to Clermont to announce the First Crusade, paid homage to his remains with a solemn ceremony, which was tantamount to a canonization. With this act, Blessed Urban II, in the figure of Erlembald, offered a model for the miles Christi layperson, the combatant Christian, ready to take up arms and shed their own blood against the enemies inside and outside the Church. To him and St. Arialdo, today we direct our prayers.